A primary currency for the purchase of goods and services, gold trading has been going on since the ancient world. It is commonly considered that the year 1880 marks the point that modern foreign exchange and gold trading had begun, correlating with the fact that the Gold Standard – which defined the value of a currency in relation to gold – was launched that same year. How to trade gold strongly depends on the judgment of the fluctuation of other currencies. Though Gold is no longer used as the principle currency in most countries, it is still an incredibly influential commodity which continues to strongly impact those currencies. The trading of gold is typically conducted in relation to the US dollar, as that is how the metal is typically valued. Online gold trading, however, can also be done with the euro, the Japanese yen, or any other currency for that matter. As a general rule of thumb for gold trading, it can be said that if the value of the US dollar declines, then the value of gold rises. However this is not a strict truth to abide by when conducting online gold trading, because gold is a globally used commodity and reflects worldwide tendencies, as opposed to just that of the USA and its currency’s fluctuations. 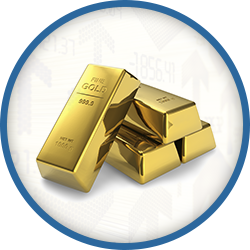 This page contains a chart which you can use to make more informed decisions for your online gold trading activities. You can this chart to perform your own analysis and thus decide how to trade gold for the near future.